Ecuador is full of hummingbirds. There are over 130 different species of hummingbirds in Ecuador, and many of them are here in the Andes mountains. Ecuador is also full of public art. Currently, there is an exhibit in one of the plaza's here in Cuenca (Otoronga Plaza) of statues of hummingbirds that have been sculpted by one artist and then each painted by various artists. The exhibit started in Quito and is currently traveling the country. Here are a few pictures of the magnificent display. Remember that you can click on the pictures to enlarge them. Well worth doing that here. My friend, Tresa, who lives on the 16th floor and has a different view of the construction site than we do, sent me this picture of Poochito. He's absolutely fearless as you can see. Fearless, except for when the diabla blanca shows up. He ran from me again the other day when I showed up with dog biscuits. After throwing a few his way, he came and took several out of my hand. But he would not let me pet him. We are, as I thought we would be, back to square one. See that little black dot at the edge of the 6th floor? That's Poochito surveying his realm. If you click on the picture, it will enlarge, and you can see that he's lying there with his feet hanging over the edge. That would scare me, but the only thing that scares him is me. 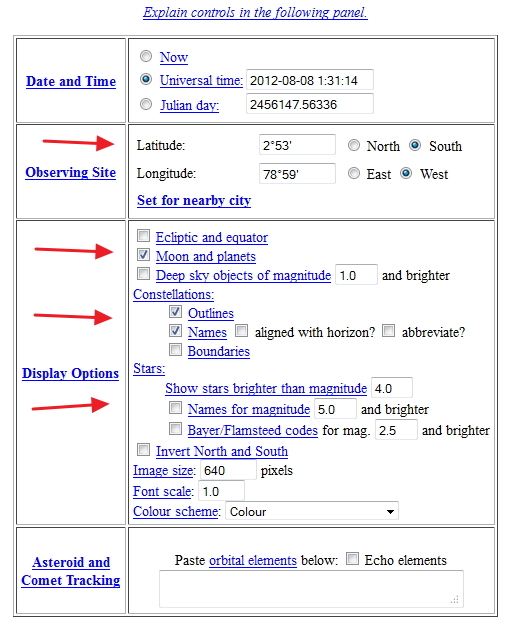 With all the delightfully clear weather we’ve been having lately, now is an excellent time to share with you some research Gil did on star gazing websites. 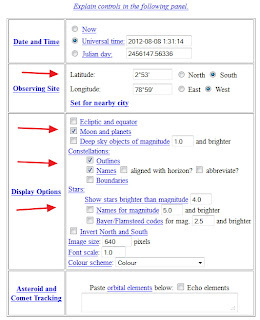 He wanted to find a URL that would tell him where to look for the Southern Cross and other constellations on any given date, as well as help him identify other points of light in the nighttime sky. Below are samples of what you will see at that website, as well as suggestions on how to use the menu choices offered there. When you first go to the website you’ll see something like the screen shot below. Note the “Update” button at the bottom of the screen shot; this is the key button to click after making changes to the menu options which will be discussed next. Scrolling down the webpage you will come to the menu options shown below. 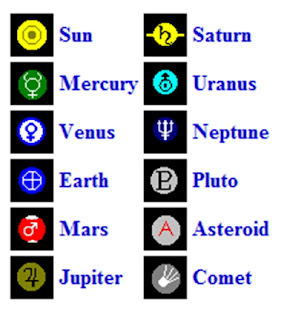 There are many choices for those of you who are astronomers and know about such things. Gil has inserted four red arrows showing inputs that he uses, that will bring up the sample screens shown further down in this blog. I’ll talk about those arrows in a moment. 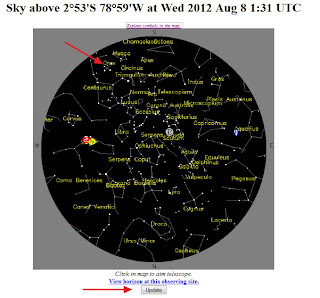 The arrows are below the box where you can enter the date and time of the night sky you want to see. Note that the default of UTC time is five hours ahead of Cuenca’s, so you might want to adjust it. 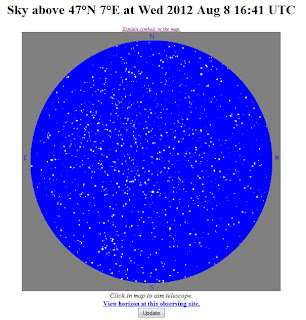 In the screen shot shown below, the website is showing the night sky for a UTC of 1:31 on August 8th, which is equal (subtracting five hours) to 8:31 pm on August 7th in Cuenca. 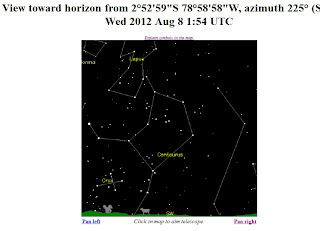 The third arrow shows that Gil has clicked on the boxes that will allow him to see the names and outlines of constellations. When Gil clicked the Update button after making the above menu changes, he sees this screen shot below, showing constellations and planets. 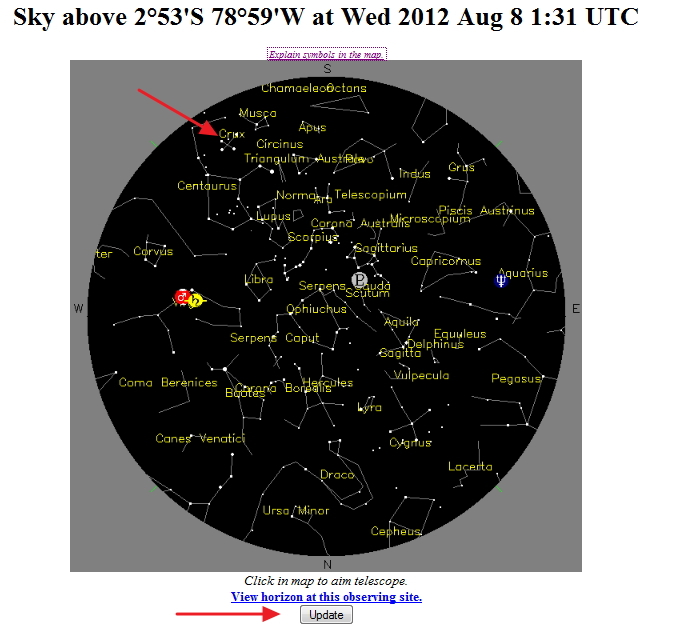 He has added a red arrow showing the Southern Cross, a.k.a. Crux; at 8:30 pm on August 8th it’s in the southwest sky near the horizon. He has also inserted a red arrow at the bottom as a reminder to use the Update button. The above screen shot also shows that four planets will be above Cuenca on that date at that time of night – Mars, Saturn, Pluto and Neptune Here is the list of standard symbols available at the web site. In addition to the straight upward view, the website offers views toward the horizon. Below is the view of the constellations, etc., looking toward the southwest horizon; the Southern Cross (Crux) is visible above the gray animal that appears to be a squirrel. The website lets you pick any of eight compass directions – north, northwest, west, etc. 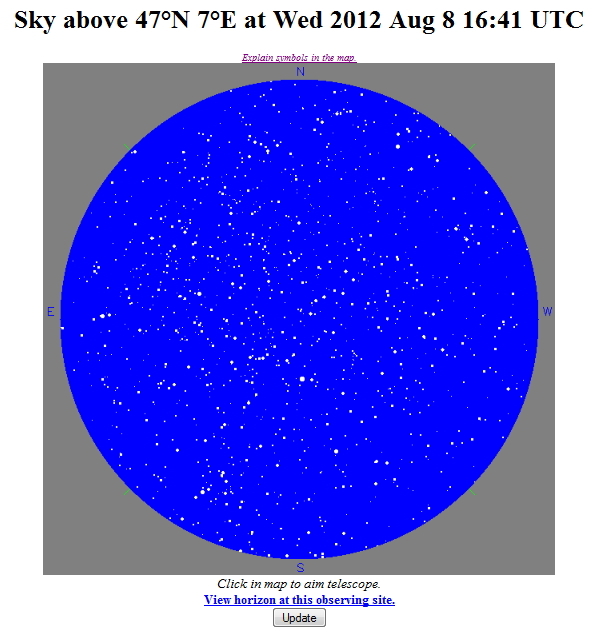 The website offers many other viewing options that amateur and not-so-amateur astronomers might have fun exploring. Enjoy!